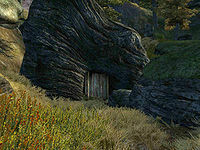 Red Ruby Cave is a medium-sized cave southeast of Bruma containing monsters. 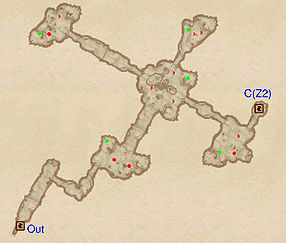 It contains two zones: Red Ruby Cave and Red Ruby Hollows. This cave contains 10 Cairn Bolete plants and 14 Wisp Stalk plants. Red Ruby Cave also appeared in ESO. 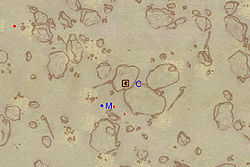 This location's map marker (M on map) is named Red Ruby Cave (editor name RedRubyCaveMapMarker). The entrance door is NE of the marker, 50 feet away. Red Ruby Cave is a fairly unremarkable cave with no unique features to distinguish itself from other caves in Cyrodiil. There are no red rubies to be found here, and the cave's layout is linear for the most part. The second cavern in this zone works as an intersection between three parts of this cave section; the rooms ahead and to the left of you contain basic enemies and chests, while the right passage leads you to door C, which connects this dungeon section to the second area, Red Ruby Hollows. 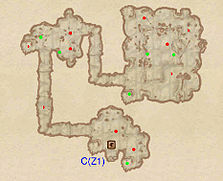 This zone is relatively straight-forward; simply navigate through the various cavern rooms and halls until you reach the last chamber which has three of this zone's chests (green dots on map). 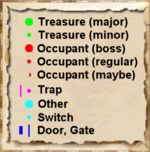 Two are in the second cavern area, while a single chest is near the entrance. Clear this zone of monsters and treasure and return to Red Ruby Cave.